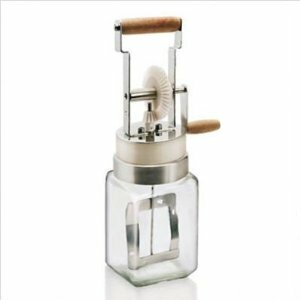 The Paderno World Cuisine fresh butter maker is a clever device designed to create fresh, home-made butter, which brings unparalleled taste to any dish. Cream is poured into the jar and rotated with the hand crank until it stiffens. Then the whey is discarded, the butter is rinsed with cold water and kneaded. Click the button below to add the Paderno World Cuisine Fresh Butter Maker to your wish list.